Doug Turbush is carving out a niche for himself within the East Cobb community, creating approachable neighborhood restaurants that feature local ingredients prepared simply and elegantly. The acclaimed chef opened Marietta's Seed Kitchen & Bar in 2011, serving chef-driven, modern American cuisine. He followed that with Stem Wine Bar in 2013, featuring European small plates and a variety of Old World and New World wines. Drift Fish House & Oyster Bar was added to the roster in 2016. Becoming one of the area's most acclaimed restaurateurs is "beyond my wildest dreams," Turbush says. "All this began because I was just trying to open one restaurant close to my house." Prior to his entrepreneurial debut, Turbush was executive chef of Bluepointe in Atlanta, a AAA-rated, four-diamond fine dining restaurant. While there, he created a tremendous following and garnered many awards for his deft hand with modern Asian-inspired seafood dishes, sushi and prime steaks. Turbush also gained extensive experience working in kitchens such as Buckhead's Nava, Goodfellow's in Minneapolis, Minnesota, and The American Club, a AAA five-diamond resort in Kohler, Wisconsin. His menus reflect the flair of an international traveler who has lived and worked in Bangkok, Thailand, and has traveled extensively to bring bold and exciting tastes to his tables. Experience, and particularly his tenure at Bluepointe, helped hone the commitment to high-quality ingredients that has become a hallmark of the menus at all three of his restaurants. "The driving force has always been quality," he says of his career. "I never let my guard down as far as my standards and what we let in the back door of the kitchen. As a chef, you can have the greatest menu in the world, but it doesn't mean a thing if you don't have the very best ingredients. Making sure we have that commitment to local sourcing and local ingredients is my top priority." 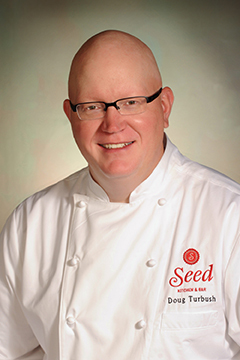 Turbush graduated with honors from The Culinary Institute of America in Hyde Park, New York, and holds a Bachelor of Science degree in hospitality and tourism management from the University of Wisconsin. The East Cobb community has embraced Turbush and his restaurant teams. Both Seed Kitchen & Bar and Stem Wine Bar have earned a reputation for genuine hospitality and high-quality food, wine and cocktails. As a result, they've served as the cornerstone of a rapidly developing restaurant scene and paved the way for Turbush to open Drift. "Since we opened Seed, I think we've counted 16 restaurants opening within a mile and a half of the restaurant," he says. "I'd love to claim credit for it, but I don't control the economy, which has definitely brought more dining business to the area. To see the level of cuisine and the number of places for foodies here in East Cobb these days is great." Turbush's dedication to the highest-quality food and service, along with a commitment to the connections between chef, farmer and community, are proving to be a recipe for success.